Sky and Virgin TV customers will be able to watch LFCTV completely free this weekend – and take in Liverpool FC Legends' clash with Milan Glorie as part of the promotion. From 9am GMT on Friday March 22 until 6am on Tuesday March 26, the club’s official television channel will be free to view on Sky and Virgin platforms. You will be able to watch all of LFCTV’s programming, including regular shows such as LFC Later, Press Box, LFC Trending and Kings of Europe. In addition, you can watch coverage of the charity match between LFC Legends and their AC Milan counterparts in full and live from Anfield from 2pm on Saturday. Kenny Dalglish will return to the dugout to take charge of the Reds and will be able to call upon the likes of Steven Gerrard, Jamie Carragher, Luis Garcia, Sami Hyypia and Dirk Kuyt. In opposition, icons from Milan’s illustrious history such as Kaka, Cafu, Paolo Maldini, Andrea Pirlo and many more will line up against the hosts. 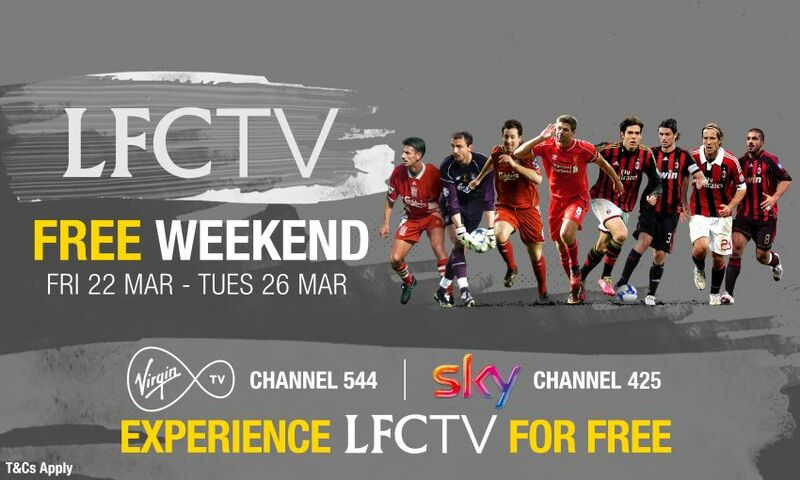 So make sure you take full advantage of this chance to tune into LFCTV completely free for this extended weekend.